I love the wire work on the circular piece. Great design! First thank you again for inviting me to be a part of the Creative Continuum of Seven Artist I am having a wonderful time so far. 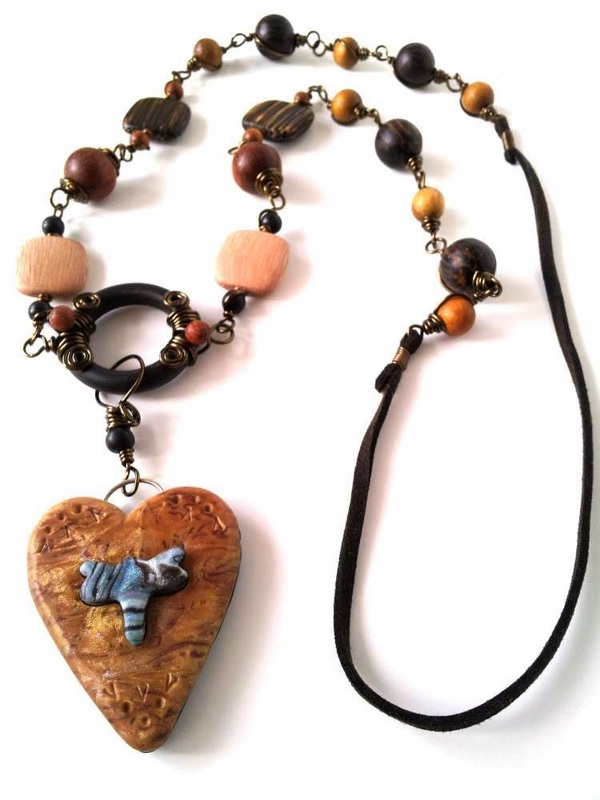 I love the In The Woods necklace and do not blame you at all for wearing it often it is beautiful ( I have Cindy's book it is wonderful ) I am looking forward to seeing the heart necklace and bracelet finished and my vote is for Ancient Times. Oh and I love the earrings too. Alicia~that wooden ring with the wire!!! I love how you did that piece...a focal for the focal. It is gorgeous! the necklace itself has a beautiful flow to it and is perfectly named. And the earrings are wonderful! 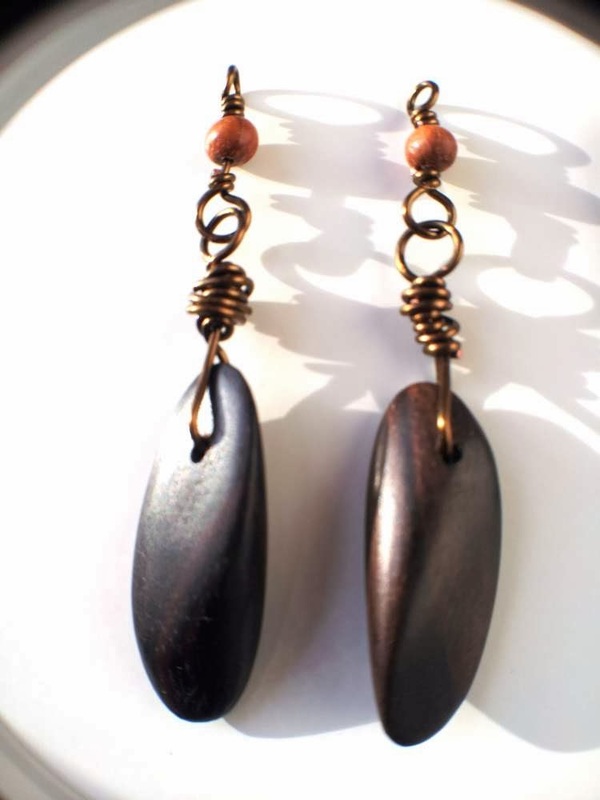 After seeing yours, I wish I thought of earrings...those wood pieces are a great shape for earrings. 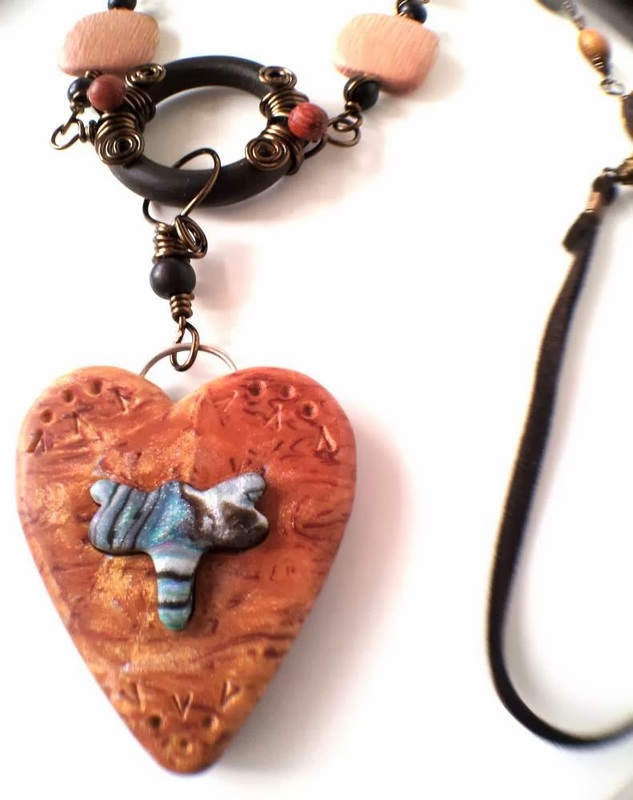 I really like the vibe of your heart piece and potential bracelet. They do whisper back to a different time. Thank you so much for being the brains behind this hop. I am having so much fun opening the packages, seeing what surprises are in store, and unleashing the ideas. Very interesting that so many people commented on the wire-wrapped ring! For me it was such a natural doing that I don't see it as special (shows why you need sounding boards on everything!) Thank you for the lovely comments - and I am so glad you (and everybody in the Continuum) are having a good time: that was my intention from the start; to have fun together! Look at all the beautiful wirework!! 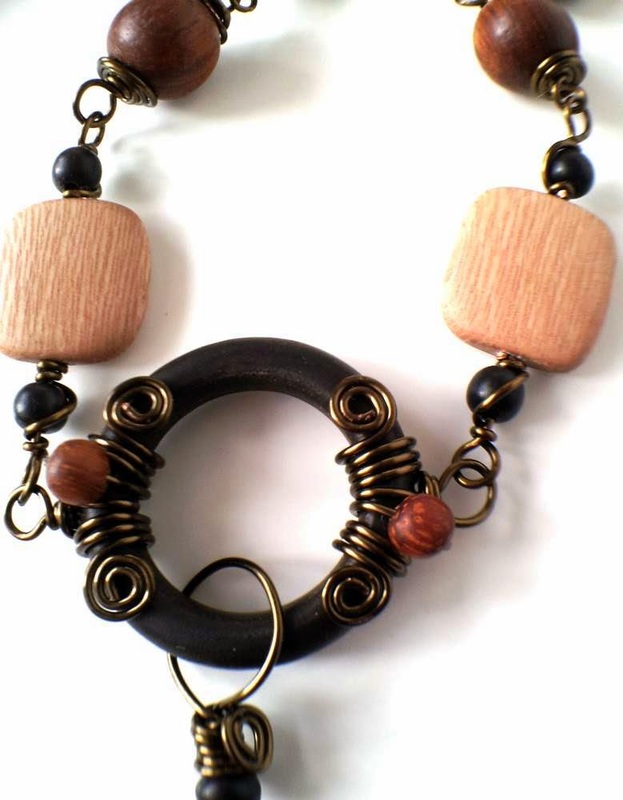 Oh, the wire scroll work around the wood ring drew me right in, beautiful necklace! Clever idea with the earrings, they are cool!! And the heart pendant the way you have it suspended, I keep looking at the curve of the embellished thicker gauge wire, eye catching! Thank you so much for taking the time to gather us seven together! I'm loving every minute of this WONDERFUL group!! I'm so glad you showed all of Monique's beautiful package .... I think together our two posts combine the story! ha! all the beady beauties from Monique along with her Canadian Artist inspiration!! What beautiful wirework Alicia - as always! I just love seeing where you will take it next! That woody gorgeous necklace is perfect! and matches Monique's inspiration to a T! oh those cats! I ran out of room on my post .... I'm going to have to show you my cats later in the week - love those little guys! Hehe, I can't wait to see your cats (and I need to finish mine too). Thanks for being part of the Continuum! Alicia, I have been sitting at my computer for some time, with my jaw on the floor! I have all the reveals open in front of me (tempting fate with my computer)... to say I am touched and humbled by what I am seeing is a BIG understatement! I am having difficulty choosing words (I know, that's not me) to express how much the work of all you gals has cheered and amazed and elevated my spirit this morning! Thank you so much for letting me be a part of this group, Alicia... as I said, I am humbled and thrilled beyond words. And just think, we get to do this SIX more times,,, yay! Well, my friend, the feeling is mutual - I've been admiring your incredible work over and over today! You should be proud of yourself, very proud - your work is exquisite. 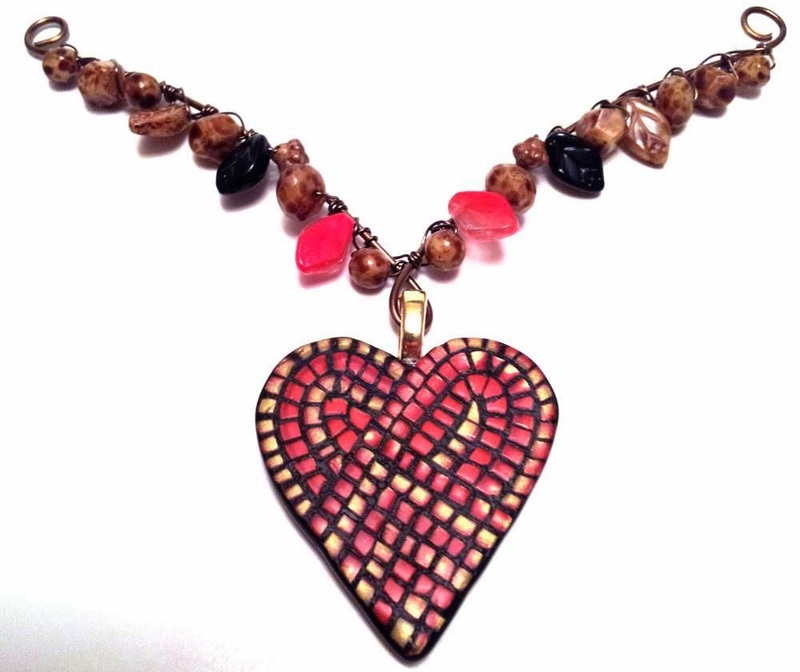 Hehe, wait until I get my hands on the Kumi cords - the red / brown / black combination is very elegant and I just know it'll be perfect for your mosaic heart and accompany beads! Indeed - this is just the start :) Thank you for being part of the Continuum! Those hearts of Monique's are lovely! I especially love the mosaic one. You've done wonderful things with both - beautiful! Thank you for your warm comments! As I'm drawn more and more to wire work I have to really admire all of yours! 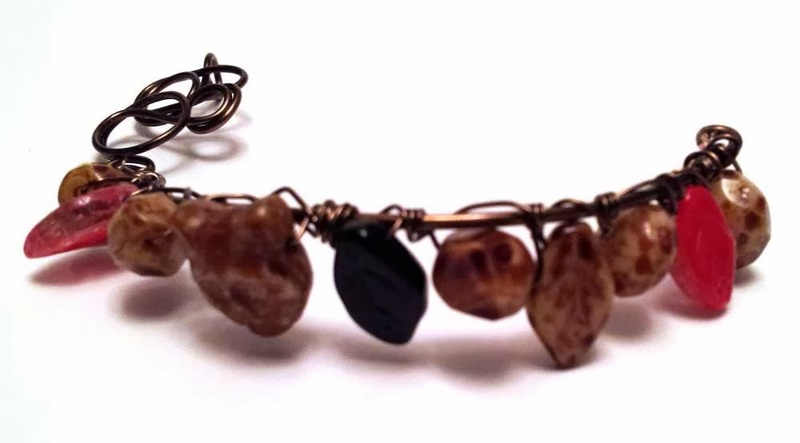 Each piece is lovely and is really enhanced by the wire! Thank you :) I still have to add the ear-wires! Wonderful designs Alicia. The wirework on the ring is outstanding. It really makes the piece.I think that kumihimo will be the perfect accent for your bracelet. I agree about Cindy's book too. Thank you, Becky - it's really funny how that ring drew all the attention :) Kumihimo will be, the vote is unanimous!